- medical research into FLUORIDATED WATER, etc. 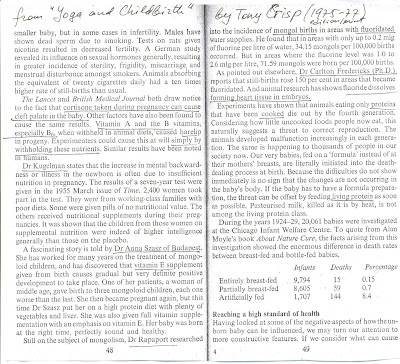 from the 1975 book by Tony Crisp "Yoga and Childbirth". 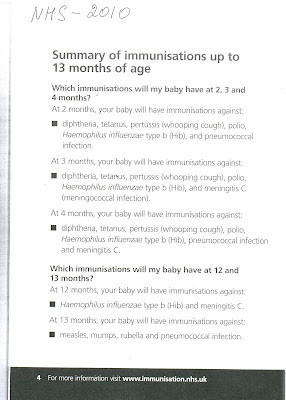 - NHS 2010 Summary of Immunisations up to 13 months of age. Is this exclusively British practice or WHO for all scheme? My Gosport GP Dr. R.Try has emigrated to Australia, as I learned yesterday. And I was thinking about writing a Thank You letter to him and making a confession. Amazing, how even in the medical registration forms they do not ask about BLOOD GROUP, which is essential for blood transfusion, while requesting Blood Donor Registration (voluntary). ZENIT thing ... since I mentioned Zenith for the first time, I have not seen lorries Zenith, but encountered rustic dark geen/gold Zenith vehicle near Carisbrook Rd. and charity travel buses (near Waitrose), from which a boy waived to me - at the bus stop. I think I missed Zenit in the Wikipedia entry, when I did check it, hence "in addition" in my last entry. Interesting how many small mistakes you make, when you try to write about what is not talked about. It' all in the mind! with a picture of the pine forest, where we (long after Stalin's death) went skiing in winter as children. There was a unique splendid air in that forest - the main attraction. The comments to that article contain some interesting facts. It looks like Gorbachev's New Thinking about "obschechelovecheskie tsennosti" is not so new, but a replay of COSMOPOLITANS ideology of Stalin's times. Am I right ? Born in Soviet Russia, living abroad since 1975. Dutch citizen since 1995. Moscow-Lagos-London-The Hague, back in UK since 2002. M.Sc., M.Ed. Teaching and research: universities in Moscow, Lagos, London, Amsterdam. Companies: Shell, ABB, etc. Some publications. Lang. : Russian, English, Dutch. Contact details:[ E-MAIL COMPROMISED .... sorry] - vasilisa78@hotmail.com Post: 26 St.Matthews Court, King Street, Gosport, Hants PO12 1AN (England,UK) Mob.tel: 07 91 901 0033 ( text ).